Testing a large diameter floating backup ring in RCD operating conditions - Kalsi Engineering, Inc. The test fixture layout is shown in the cross-sectional illustration that is included below, and is based on the stacked housing arrangement shown in chapters D17, E2, E4, E5, and E6 of the Kalsi Seals handbook. The fixture is configured to test two high pressure rotary seals at a time. The fixture simulates the high pressure sealing location of the type of RCD that uses one rotary seal to partition the drilling mud from a pressurized lubricant, and uses another rotary seal to retain the pressurized lubricant. In the fixture, Two oppositely facing Kalsi Seals are supported by a pair of oppositely facing backup rings. The high pressure lubricant is located between the Kalsi Seals. The backup rings are axially force-balanced, and positioned radially by the mandrel, in the manner described by our U.S. Patent 9,429,238. The surface of the mandrel that slips rotationally with respect to the Kalsi Seals and backup rings is coated with ground and polished tungsten carbide. Lip seals are located outboard of the Kalsi Seals. The lip seals collect the hydrodynamic pumping related leakage of the Kalsi Seals and define separate upper and lower sealed channels. To simulate the limited drilling fluid exposure an RCD mandrel experiences in the region between the packing element and the mud-to-oil partitioning seal, a low pressure water-glycol mix was circulated at three to four gallons a minute through the upper sealed channel. The lower Kalsi Seal was considered to be the test seal, because of the axial separation between it and the circulating coolant—a similar axial separation occurs in an actual RCD. The pair of PN 381-35-11 rotary seals was tested at a pressure differential of 1,500 psi (10.34 MPa) for a total of 142.45 hours, including four hours at 90 rpm, 17.8 hours at 150 rpm, and 120.65 hours at 190 rpm. The high pressure seal lubricant was an ISO 320 viscosity grade synthetic hydrocarbon oil. The dynamic runout of the mandrel ranged from 0.0035” (0.09mm) to 0.0100” (0.25mm) TIR. The temperature of the circulating coolant ranged from 108 to 114°F, and the temperature of the seal lubricant, inboard of the test seal, ranged from 210 to 235°F. Although the lower Kalsi Seal was separated axially from the circulating coolant, it was in virtually new condition at the conclusion of the test. The backup ring and the mating surface of the mandrel were in excellent condition, and one could identify three locations around the journal bearing bore of the backup ring that had been in rubbing contact with the mandrel. The only lubrication received by the journal bearing bore was the modest hydrodynamic pumping related leakage of the lower Kalsi Seal. (In an actual RCD, the journal bearing bore would be flooded with the lubricant that is provided for the rolling element bearings of the RCD.) This initial test seems to suggest that constructing the backup ring entirely out of steel may be feasible for use with ISO 320 viscosity grade lubricants; however, more tests are needed before such a conclusion can positively be reached. The journal bearing bore of the upper backup ring was exposed to the low viscosity water-glycol mix, and this fluid was unable to fully lubricate the sliding interface between the backup ring and the rotating mandrel. As a result, the tungsten carbide coated surface of the mandrel was damaged from contact with the bore of the backup ring. This damage took the form of circular scratches. These scratches took a toll on the upper Kalsi Seal, gradually grinding away at the dynamic lip until the lip was breached, after 142.45 hours of operation. In typical RCD service, the backup ring would be exposed to the bearing lubricant, rather than to a low viscosity water-glycol mix. We plan additional testing of the 10.50” Type 2 floating backup rings. 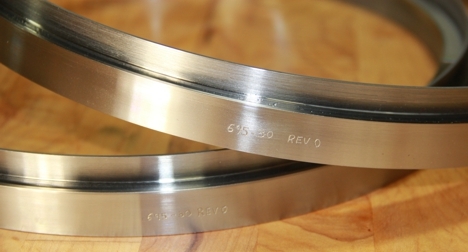 More tests will be done to evaluate the suitability of steel as the journal bearing surface of the backup ring, and if necessary, backup rings will be produced and tested that use more typical materials or coatings to define the journal bearing bore. In addition to testing rotary seals that are manufactured entirely from elastomer, we will also be testing several different types of plastic-lined seals. Some of the 10.50” plastic lined seals will have unique geometries that are directed at reducing the amount of hydrodynamic pumping related leakage. 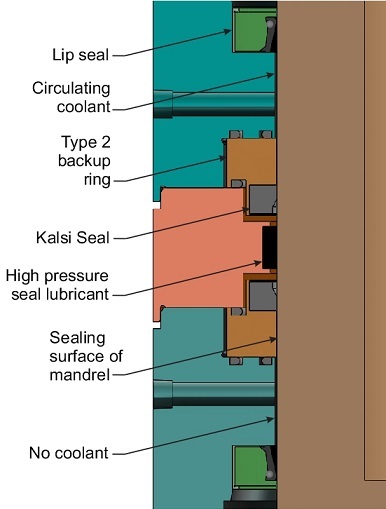 The high pressure seal lubricant is located between two oppositely facing Kalsi Seals. Each Kalsi Seal is supported by a shaft guided, axially force-balanced floating backup ring that compresses the seal radially against the mandrel. These are the 10.50” Type 2 floating backup rings that were tested. This is the used test seal from the lower backup ring after 142.45 hours at 1500 psi.